Model- Optomag-7. Leveraging on our quality oriented professionals, we are offering Illuminated Magnifiers to our clients. 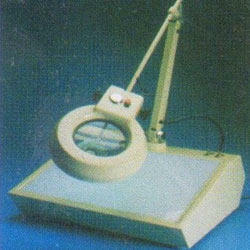 These magnifiers are hailed for their accurate dimensions, unique quality and excellent magnification capacity. These magnifiers are offered in different range and are tested fully for their performance. We are sure that these magnifiers would be able to meet your requirements fully. Lighting: Top 22 Watts (230 V) Circular fluorescent tube avoids shadows, bottom 22 Watts (230 V) Circular fluorescent Tube for uniform, lighting on light table, separate switch provided for individual, lighting. Price Range:- As per the buyer requirement, product price varies from Rs 5500/- to Rs 9500/-. Optics & Allied Engg Pvt. Ltd., is an established Bangalore based company since 1985 with its Office & manufacturing facilities located in Bommasandra, near electronic city. Our focus has been on global customers in the areas of Polymer & Glass Optics,LED Lenses, LED Backlights, Optical instruments, Precision plastic moulds and moulded clear components and Product assemblies. We manufacture and Supply Optical lenses, Aspheric Lenses, Prisms, IR Optics, Optical Filters ,Big Schileren Mirrors For Aero space, Optical Mounts and Other custom Made Optics. we have specialized in making moulds & Moulding of polymer lenses / LED lenses / Sensor lenses/Highly polished transparent parts in Clean Room Area. LED Backlight/LED Light pipes: We do manufacture Different types of LED Backlights and Light pipes used in Energy meters and digital Display unit and LED Light pipes used Instrument for light Indication. We can supply Diamond Turn optical components like Germanium and Silicon Lenses, Prototype lenses made out of PMMA, PC, Aluminum, Nickel Copper, Copper etc. We Market & manufacture Zoom Microscopes / Microscopes/ Measuring Video scopes/ Illuminated Magnifiers / Magnifying Lenses & Custom made Optical Instruments etc. Over the years we have developed the skill knowledge and competence to build complex injection moulds to augment to various customer applications and supply precision molded components. We serve reputed industries engaged in Aero space / LED lighting / Auto & Auto electrical / Eye care / health care / Electrical & Electronics / Communication / EMS. We also export parts to Europe and other countries. Our facility is equipped with concurrent CAD & SPC software for design, development, molding process to assure Quality / On-time delivery at competitive price. We have a team of qualified & experienced Engineers & Technicians to effectively serve the customer needs.